Welcome everyone, this is Mac with another N5 Grammar Lesson from JLPT Boot Camp. Last episode, we learned how to use adjectives to talk about things in the past politely. Today, we are going learn how to use the は particle, sometimes called the topic marking particle. We are going to look at a few, very short exchanges. Let’s give it a try. Let’s join our favorite couple Matt and Yu eating at a restaurant. She is trying to persuade Matt to eat some food. Breaking that down, Yu said, なっとう, natto or fermented soybeans, は, the topic marking particle, おいしい, delicious, and finally よ, a particle used for emphasis. All together Yu is saying “Hey, natto is delicious.” And by using the よ particle, she is kind of suggesting that Matt agree. And if you are not familiar with natto, fermented soybeans. It’s a common Japanese breakfast food, that’s quite gooey and sticky and often has an unpleasant smell. I like it, but others can’t stand it. I encourage you to give it a try if you haven’t. It’s quite good in my opinion. Anyway, Yu was using the はparticle, probably one of the trickiest particles to master at the N5 level. To make it more confusing, it can serve two functions – a topic marking particle and a particle used to mark contrast. We are going to go over the topic marking function first. And for starters, you are probably wondering what exactly is the topic of a sentence. In Japanese, it is actually different from the subject of a sentence. This is obviously quite confusing. And it is best to try to forget about an English equivalent because there isn’t one really. Valid topics are something that both the speaker and listener have knowledge about, can be perceived by one of the 5 senses, a generic noun, or a proper noun. I like to think of the topic as a box you are putting the sentence in. It’s a way of ‘sorting’ out what you are talking about. Thinking about Yu’s line – なっとうは　おいしいよ. Delicious is the meaning we want to convey. And by putting it in the ‘natto’ box, we can understand that the two are related – natto = delicious. So, one structure to remember for this particle is AはB means A = B. And now that we ‘put the box out’ by mentioning it in the first sentence, we don’t have to do that again. Matt can simply say おいしくない and we understand that he is talking about natto. That’s the topic of the conversation. This is one of the main tasks the は particle does, it gives the sentence context by sorting it out. Why don’t you try an easy example out. Let’s talk about this sushi. Can you make a sentence about it? Can you say “this sushi is delicious”? Breaking it down, この, this, すし, sushi, は, the topic marking particle, and finally おいしいです, polite way to say delicious. Note that we need to use この to talk about this specific sushi that we are looking at here. If we said すしは　おいしいです (sushi is delicious) the listener might think that we are talking about all sushi, not just this specific sushi here. Let’s go back to Matt and Yu for one more exchange. (As for me,) I eat natto. (As for me,) I don’t eat natto. Here we see the は particle being used in a slightly different way. Here it is being used as a contrasting particle. Yu is saying “As for me” and she is implying a comparison between her and others. In this case, she is kind of comparing herself to Matt. Matt in turn is contrasting himself to Yu. Let’s give it a try. Imagine if someone asks you what kind of music you like. You listen to rock music. How would you respond? (As for me,) I listen rock music. Can you tell me the following in Japanese? Red in Japanese is あかい, and flower is はな. For “Red flowers are pretty”, you would say あかいはなは　かわいいです. We start with あかい, for red, はな, flower, then は, the topic marking particle, next かわいい, pretty and finally we add です to make the whole sentence polite. To make it more casual we can drop the です of course. As for me, I read manga. The polite form of “to read” in Japanese is 読みます. For “As for me, I read manga.”, you would say わたしは　マンガを　読みます. We start with わたし, I , then は, used here to show contrast, next マンガ, manga, and then the を particle, the object marking particle, and finally 読みます, to read. So what was all that again? Let’s review. We went over two ways to use the はparticle today. It’s most common use is to mark the topic of the sentence. It acts as a box that we sort the conversation into. It helps provide context and make the meaning more clear. If the topic can be understood from the conversation it doesn’t need to be restated. It can also be used for contrast to imply a comparison with other similar topics. It is often used to talk about preferences as in talking about what you like to listen to or read. That’s it for this episode. For notes and more practice with the grammar point, stop by the JLPT Boot Camp courses site. There you can find quizzes, study guides for this grammar point and every grammar point covered in the videos. You can also get all of your questions answered you might have. Just leave me a comment, and I’ll get back to you. 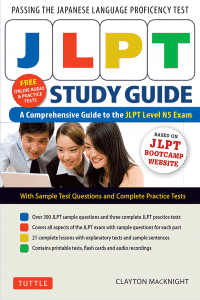 The JLPT Study Guide for the N5 is now available at Amazon. Packed with exercises to help you master all the grammar points needed for the test, this is a must have study guide for anyone preparing for the N5. It also has reading and listening strategies and practice exercises so you can hone those skills before the exam. Once you’ve finished the book, there are 3 practice tests to check your level and 100s of audio flashcards you can use anywhere to review what you learned. Thanks for watching and hit the subscribe button for more helpful videos like this one.